Great idea. Control and expression are important elements of good user experience. A key part of the Moto X's story is one of hardware customization. At launch, those users buying Moto Xes on AT&T will be given the option of selecting from 18 back colors, 2 front colors and 7 accent colors. Additional options include custom text on the back of your device, storage capacity (16GB or 32GB), charger color, cases and headphones. It works out to around 504 different possible combinations of Moto X choices users can select from. I won't go into great detail on the Moto X here as Brian has already done a great job of that in his original piece, and we have a full review in the works. If you show up at an AT&T store, you'll be able to see examples of color combinations in person, but you can only go home with a woven white or woven black model. This is the composite material, carbon fiber-looking back we've shown photos of already, with a matching black or white front. If you want to customize a Moto X, you can buy a Moto X redemption card - good for one customized Moto X. Take the redemption card home, head to motorola.com/designit, type in your PIN and off you go. The AT&T store visit is purely optional however, you can just go to motomaker.com and buy a fully customized Moto X directly from Motorola. In both cases, the Moto X receives final customization and assembly in Fort Worth, Texas. The process should take approximately 4 days depending on component availability. If you don't like what you end up with, you're free to exchange/return the device within a 14-day window. There are a few minor bugs/inconsistencies in the Moto Maker webapp itself but otherwise the process is quite painless. It's pretty easy to tell what color combinations work or don't work, and Motorola has a number of recommendations for designs already made. As with any online configurator, image accuracy is always a concern. We won't see the results of our customizations for a few days, but we'll do a follow-up post comparing what Moto Maker presented us with and what it looks like in person. At present the options include the different colored backs which are polymer, in addition to the two woven composite materials. Other patterns will gradually be made available, along with the wood back options that we were shown, although Motorola still doesn't have specific timing beyond saying sometime in the Q4 timeframe for those wood options. It took me much longer than I expected to settle on a color combination. There aren't an overwhelming number of choices, but there are enough options to make you think - and a number of really good looking combinations. I found it very easy to put together a fairly subtle phone with a splash of color thanks to the 7 accent colors, but I ultimately ended up designing something pretty over the top – lemon lime with yellow accents and the white front. Brian settled on olive with silver accents and the white front. There is a small amount of software customization that comes with Moto Maker. 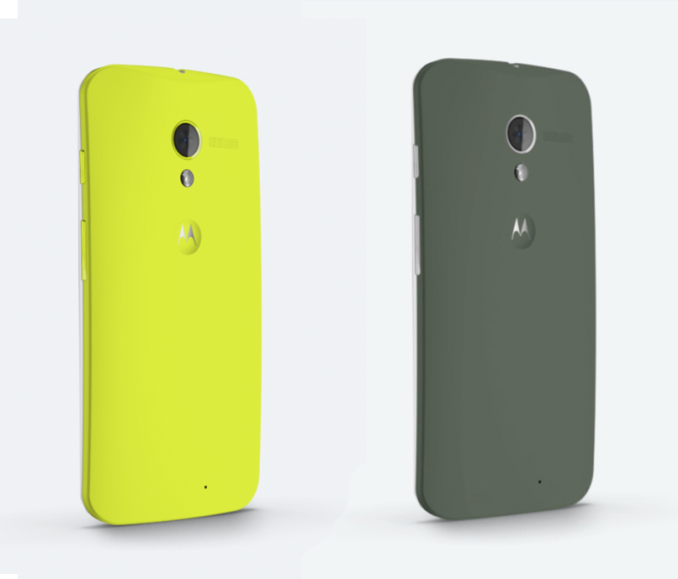 Based on the color you choose for the back of the Moto X, Motorola will pre-select a wallpaper that matches. You can specify custom text to be displayed at boot, and finally you can opt to automatically setup your Google account on the phone to simplify the out of box experience when you finally get it. The purchase experience is something that we rarely talk about in our reviews, but it does play a major role in customer satisfaction. I feel like Moto Maker is a successful attempt to improve the smartphone purchasing process. The customization options are easy to get excited about, and the overall experience is without equal in the phone space today. Given how personal these smartphones are, the customization play with Moto Maker is clearly very well thought out. As we've seen in the past though, personalization alone isn't enough to make for a successful product. Stay tuned for our full review of the Moto X.